Would you like to download Ekiga? Assisted NAT Support (automated STUN support): Ekiga has extensive and improved NAT support. In most of the cases, you do not have any configuration to do. 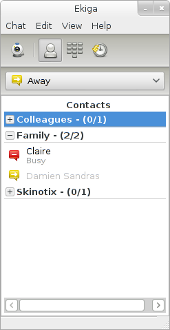 Integration with Novell Evolution: You can share your contacts with the groupware client for Linux, "Novell® Evolution™"
SIP dialog-info notifications: they allow displaying notifications of incoming calls in the roster, and being informed of incoming calls reaching your contacts (if the server supports it, e.g. Kamailio and Asterisk do). Registrar Support: You can register to SIP compliant VoIP providers. Gatekeeper (RAS) Support: You can register a VoIP service using H.323. H.323 standards in the OPAL stack.